To call it the ugliest Confederate statue in America seems a bit redundant, but the statue of Nathan Bedford Forrest on Interstate 65 in Tennessee undoubtedly wins that distinction. The deranged interpretation of Forrest, a Confederate general, human trafficker and leader of the Ku Klux Klan, has been an eyesore in Tennessee for nearly 20 years. Depicted on a rearing gold horse, the silver-foiled statue of Forrest captures the Confederate asshat looking like Satan’s ugly stepson on a meth bender—bug-eyed, his tongue out, his back and neck contorting around in an impossible angle to shoot something behind him. 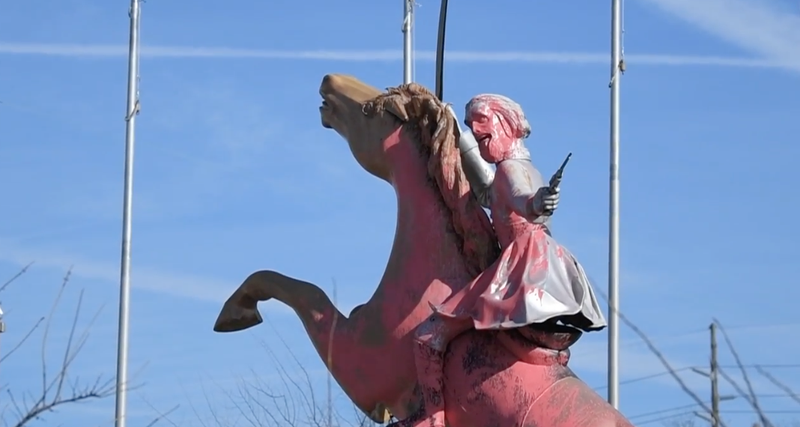 Then, earlier this week, the statue was doused in Pepto-Bismol-pink paint by vandals. “They’ve been trying to figure out how to cover it up,” Dorris told the news outlet about multiple attempts by private citizens and government officials to conceal the statue since it was erected in 1998. “Anybody riding around with a sheet on his head must be a coward,” Dorris said of the vandals in a video posted on the Tennessean website. Of course, Forrest himself rode around with a sheet on his head as the KKK’s first grand wizard, a fact that conveniently escaped Dorris. “I do think they’ve chose a real good color,” Dorris said of the paint, adding that he expects it will turn red in the sunlight. Last week, Memphis officials successfully took down two Confederate statues in their downtown parks, one of Forrest and one of Confederate President Jefferson Davis, after selling the public parks to a nonprofit.